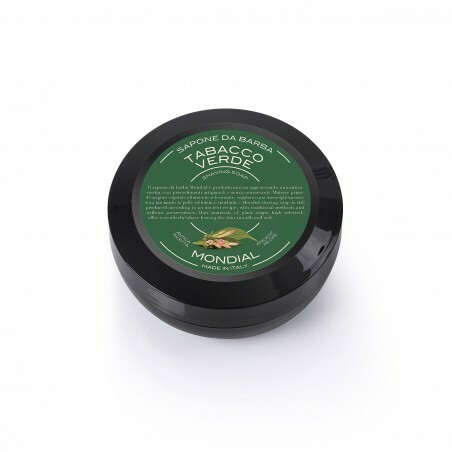 Mondial Green Tobaco Shaivng Soap 60gr. Green Tobacco; strengh, energy and comfort. This fragrance is extracted from fermented tobacco leaves. It conveys heat and comfort giving strength and energy. The aroma of tobacco has got also a masculine glamour of sensual strength and with this particular woody and wild combination it gives attraction and charisma. An intense aroma will wind around you during the whole shaving. 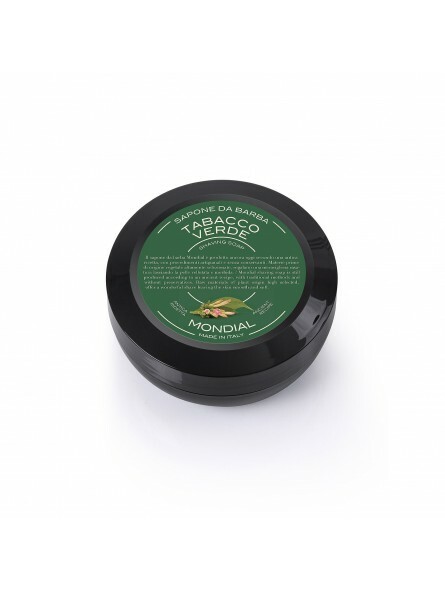 Mondial shaving soap is still produced in according to an ancient recipe, with essential oils, fragrances intense and preservative free. It is left to mature in special oak wooden trays with absolutely natural process. After an initial periods of maturing it is imprinted Mondial brand absolutely by hand and it gives charm and prestige to a product that will amaze you. The leather that comes out from these wonderful soaps, it is a real emotion that can give you a unique shaving. 60ml shaving soap format is delivered with a plastic making it ideal when travelling or simply to keep it comfortably store. This soap has a pleasant, light woody scent that lingers throughout the shave. The lather is easy to make and is thick, slick and protective. Post shave it leaves my skin reasonably moisturised. The little plastic container works well to hold the soap and looks good on the bathroom vanity. Overall, a shaving soap well worth buying.